Perfect for any bank or wading angler with a slim-line hi-modulus carbon fibre handle that creates a very lightweight package for easy transportation. The carbon handle splits into two for compact storage and features an aluminium ground spike, allowing the net to double-up as an effective line-tray. 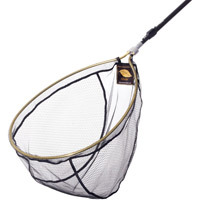 Perfect for any long-range fishing from the banks, preventing fly line tangles in bank-side vegetation. 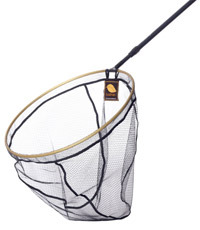 The net head features a self-adjusting angled spreader block, allowing the net to be set at any defined angle to the handle, allowing for easier netting and more effective catching of line when used as a line tray. With a super large diameter of 56cm (22in) it is capable of safely capturing even the largest trout and features rubber-mesh throughout. This again helps contribute to the lightweight design, as well as preventing dropper hooks from snagging when netting fish and helps limit the spread of disease between fisheries.  1.5m Hi-Modulus Carbon Fibre handle. 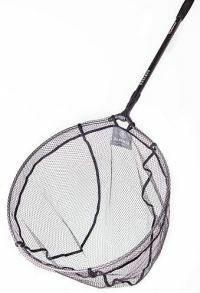  Super large 56cm/22" diameter net head.  Self-Adjustable net head angle.  Doubles up as a superb line tray.  Easy split handle for storage. The Compact Net Bag is a storage system designed especially for compact flip-up nets. It protects the net when in transit or storage and prevents furniture from unwanted smells and leakage directly after use. 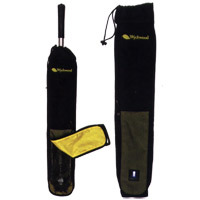 This net bag can also be used as a scabbard net holder when walking the bank as it features a belt-loop on the rear and features the Drop Dry system which allows the net to dry as it is stored inside the bag.  Limits odours & leakage in transit.  Drop Dry system aids drying.  Protects net against damage.  Belt loop for hanging. 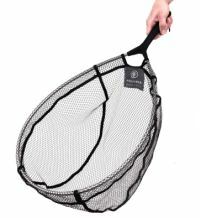  Fits most collapsible nets.  Standard - 550mm x 180mm.  Large - 700mm x 180mm. 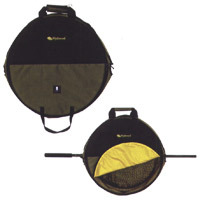 The Gye Net Bag is a storage system designed especially for Gye nets up to 25in diameter. It protects the net when in transit or storage and prevents furniture from unwanted smells and leakage directly after use. The Drop Dry system allows the net to dry whilst stored inside the bag.  Sea Trout 540mm diameter.